Accessibility & Style, this is what it’s all about. Aren’t you tired of opening apps, placing widgets and all for looking your next event location ? You change almost any detail in the events layout. • Show weekday instead of date. • Show weekday next to date. • Keep the notification on top. • Set the event search time interval for maximum relevance. 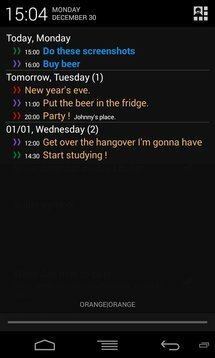 • Set events colors as calendar color. • Set each event element (Title, Time, Date etc..) font size, color & weight separately. • Set number of events to be shown. • Show\Hide events end time. • Arrange the events elements as you like (order&visibility) ! • Merge same day events under one date. • Show\Hide ‘All Day’ events. 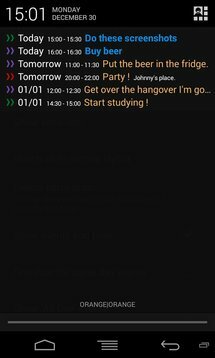 • Show separator between events (only on Expanded notification). 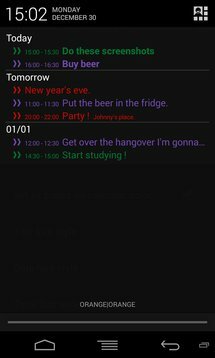 • Show calendar colored bullet and select its symbol. • Select the notification icon (inc. Transparent option) – See notice ! • ANY ISSUE – Please contact us at [email protected] when you encounter a problem. The app provides a lot of functions and works on a very large variety of devices, sometimes things doesn’t work out, we want to know that, so you can enjoy our app.